Dorian, Maria, Sarah, Andy Dobson, Dan Seymor, Ruxi (Sunday only), David Parry-Jones (Saturday only), Iulian (Saturday only), Oliver (Saturday only) & Alina (Saturday only). As most know Glenridding was hit pretty badly by storm Desmond in December 2015, restoration is in full swing but the effects of the storm can be seen clearly throughout the village including the campsite. This didn’t detour us and to be quite honest it felt good knowing that the money being spent throughout the weekend was going towards restoring this beautiful village back to normal. The weekend started with the usual Friday fight with traffic – some of us had the Friday off trying to beat the traffic most didn’t, some were lucky some were not so lucky! Arrival times therefore ranged from 14:00 to 01:00 Saturday morning! Dorian & Maria arrived first found a large enough area for the group and set-up camp. Andy arrived next with a tent big enough to accommodate the whole group (unbeknown to us at the time this would become very handy! ), this was quickly pitched before returning to the pub to wait for the rest. Message was received by Dan and Sarah who would be arriving at around 22:30 who joined us in the pub with Iulian and his group scheduled to arrive after midnight. Due to the late arrival Dan, Iulian, Oliver and Alina all bunked down in Andy’s and Sarah’s tent as they had plenty of room. Despite the late arrival it was a relatively early start the next morning for breakfast (from the breakfast van) and a quick briefing before we headed out to the mountains. David joined us for the day as he was staying locally. The weather was forecasted to be good so the planned 19 km route which took us via Dollywaggon onto Helvellyn before heading back down via Glenridding Common was on. The peaks climbed on that day included Dollywaggon Pike, High Crag, Nethermost Pike & Helvellyn. At Helvellyn after a brief discussion Dorian, Maria, David, Iulian, Oliver and Alina continued on over Lower Man and White Side Bank before heading back to Glenridding, whilst Sarah, Andy and Dan descended via Swiral Edge climbed Catstye Cam and Birkhouse Moor before heading back down to the village. The weather did hold up for the majority of the day with only a short period of showers as we were returning to the campsite. From a MMM and a Wainwright bagging perspective it was a fantastic day! A further tent was pitched that night for Iulian and Alina, Oliver set-up a tarp for the night and Dan decided to carry on sharing with Andy and Sarah. That night we all descended on the Travellers Rest pub for much needed refreshments aka alcohol and food. Table(s) were booked in advance meaning we more or less took over one half of the bar! As the pub had WiFi connection back to the world was made and an e-mail arrived from Ruxi saying that she was on her way and would be with us that night but not for dinner! Sure enough Ruxi arrived just before closing time and bedded down in her car for the night! Sunday morning we received a wake up call from Andy at 07:30, thinking a decision had been made to get on the road home earlier it was never questioned, however, it was soon apparent that Andy’s watch had stopped at 20:40 the night before and he thought we were all running late! Today’s route was devised in the pub the night before to maximise MMMs and Wainwrights before the majority of the group had to head back to base and on the road home in addition Iulian, Alina and Oliver decided not to head out today but instead do some sight seeing before heading back down south. Today our route took us over Glenridding Dodd, Sheffield Pike, White Stones, Hart Side (lunch stop) before getting to Stybarrow Dodd. Here the group again split with Andy, Sarah, Dan and Ruxi descending back to camp via Sticks Pass and off home, whilst Dorian and Maria who had the following day off carried on over Watson’s Dodd, Great Dodd before returning to Stybarrow Dodd and then onto Raise before heading back down again via Glenridding Common. The weather was fantastic all day with glorious sunshine which again lead to a great MMM and Wainwright bagging day. 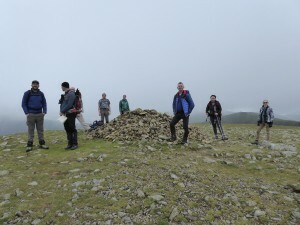 The total MMMs for the group over the whole weekend was 75,066m with 17 Wainwrights bagged!